Another personal cookbook challenge over the last couple of weeks – my 3 Donna Klein books. I’ve got 3 of her books – Mediterranean Vegan Kitchen, Vegan Italiano, and Tropical Vegan Kitchen. She has written others, and I’ve been tempted recently by Chinese Vegan Kitchen, but I wanted to get some more use out of the others before I purchased. I’ve had Mediterranean Vegan for years now; in fact, I bought it before I had ever even thought about becoming vegan about 10 years ago, when I spotted it on holiday and thought it might help me cut down on cheese a bit. The other two were both presents. Like my previous challenge, I liked all the books but really hadn’t used them much. Time to see if they are worth the space on my expanding cookbook shelves. 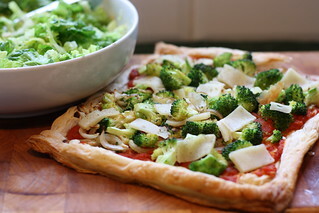 First I used Vegan Italiano to make this Broccoli Tart and served it alongside the Romaine Salad with Roasted Garlic Vinaigrette from Mediterranean Vegan Kitchen, just adding in a few chickpeas to make it more substantial. As you can see I added some Vegusto blue cheese on top – I knew it wouldn’t melt but it needed using and I love the flavours of blue cheese with broccoli. I liked this – I like pretty much anything with puff pastry, but the tomato sauce was a touch too sweet and without the sharpness of the cheese it would have been a bit dull. Quite a nice summer lunch but wouldn’t rush to make again. 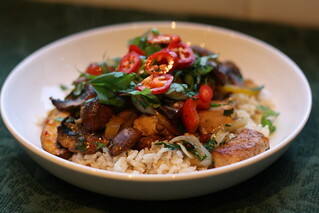 Next was the Thai Style Stir-Fry with Crispy Tofu and Hoisin Sauce. I marinated the tofu overnight so it was very quick to make and I served it over rice. It was quite simple but tasty. The Thai Style Pasta Salad was a bit odd, as it contained lightly cooked cucumber. I had a huge cucumber to use so I tried it, but added quite a bit more curry paste than the rather stingy 1/4 tsp the author suggests. I knew going in that there wouldn’t be enough vegetables in this for the ratio of pasta, and I was right, but I did quite like the cucumber in it and it’s a decent base recipe but I’d throw in red peppers and green beans next time. I didn’t get a picture of the Orecchiette with Broccoli Rabe (chickpea variation but with normal broccoli) but it was a standard pasta and broccoli dish, very quick and simple and hit the spot. Finally, and again no picture, I made the Bolivian Lentils over Rice from Tropical Vegan. This was my favourite of the bunch without question. It was very simple to make – I cooked the lentils the day before then finished it off when I got in late the next day. It’s just brown lentils cooked with tomatoes, garlic, onion, chipotle and loads of parsley, but it was so tasty it’s untrue. I will definitely make this over and over and try it as the author suggests in tacos or as a side dish. Overall it’s quite a mixed picture from these books. As you can probably tell from my reviews, they pretty much rely entirely on fresh produce. The first 2 don’t even have any tofu in, and the only pre made product I could find apart from a couple of sauces was purchased bread dough which appears a few times and which I certainly can’t get here. That sounds great in theory but it does mean that a lot of the recipes are very simple indeed, and can tend to be a bit bland and I often overlook them for that reason. When I said I hadn’t used these books much, I wasn’t lying. I can only find 2 things I’d made before my mini challenge – the farfalle with courgette, mint and almonds from Vegan Italiano, and the ditali with cauliflower from Mediterranean Vegan Kitchen, both of which I’ve made a couple of times and really like. None of the books have any pictures which doesn’t bother me, but might turn some people off. Vegan Italiano has menus, which I like, especially when so many of the dishes in it aren’t main meals, more just ways to cook vegetables. My definite favourite is Tropical Vegan as it suits my tastebuds better than the others, but if you have easy access to great fresh produce and like clean, simple flavours, the others will suit you well. 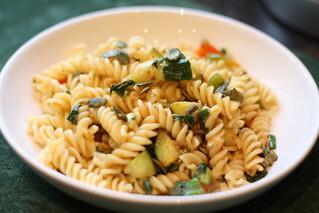 This entry was posted in Medterranean Vegan Kitchen, Tropical Vegan Kitchen, Vegan italiano by efcliz. Bookmark the permalink. I became the same way with her cookbooks although I prefer The Tropical Vegan Kitchen and Supermarket Vegan the most. She has some really good black bean soups/stews in the tropical cookbook. I will have to try the Bolivian dish now! Thanks for the review. I don’t have any of these books and although the dishes sound nice enough, I’m trying to be selective with my cookbook buying these days, so unless it’s a show-stopper it doesn’t get a place on the shelf. I’ve never even heard of these! I tend to overlook books that focus heavily on veggie-based dishes cause I’m a meaty gal. Love my tofu, tempeh, and seitan trinity! But eating enough veggies is always a challenge for me, so maybe I should cook this way more often. I’m sure it’d be healthier…. I’ve had Vegan Italiano for ages, but I’ve barely made anything from it. It never really grabbed me. I will have another look through.